Now that the eclipse events are done until January, we are settling back into the new norm that comes after the shifts in our lives caused by the eclipses. The Sun in Virgo helps us to organize our thoughts and feelings. Virgo is known for its fact-finding nature. Just don't be upset is our facts don't align with everyone else's, since we each have our own experiences and how we remember those experiences. We may be noticing the changes are coming at us faster than usual. This will slow back down as this Full Moon wanes into the new. This Moon in Pisces is the sometimes referred to as the Sturgeon Moon. It helps us to reach out to others if there is a need, either for ourselves, or for another. We are in a caring space at this time. Empathy and sacrifice soften the harsh edges of the past events. There is a Kite pattern with this full moon to Saturn retrograde in Capricorn and Uranus retrograde in Taurus. The moon's placement will hold the key to working with the Grand Trine between the Sun, Saturn and Uranus in the Earth signs. We will have plenty of good ideas and intuition to guide us and keep us on track. The retrograde planets may cause us to rethink a few events that we encounter. Yet, this can be very healing, especially with the Moon's connection from Pisces. At some level, it may be very therapeutic for us. Mercury in Leo has finished up the retrograde motion and is moving back through that "shadow" territory for a few more days. Mercury's sextile to Venus and square aspect to Jupiter expands on our charm, however, we may tend to go into overkill because we may not see our "limitations" until it is too late. Think in terms of moderation and small doses, to get be best outcomes. Venus in Libra is right at home in this sign that it rules. A lot of our interactions with others will feel "just right." However, there might be a learning curve when trying to establish new relationships. Venus is square to Pluto retrograde in Capricorn, and our "passions" may become too intense for those who don't already know us. Mars has moved back into Capricorn in retrograde motion. By midweek, next week, Mars will be done with the retrograde and pushing forward again back into Aquarius. However, Mars will not be done with the Out of Bounds (OOB) transit in the southern declinations. In fact, this is one of the longest Mars OOBs in recent history. Mars will continue to transit OOB for another month. This means that natural disasters are likely to increase with intensity. It also impacts how we are affected by the events. Some refer to Mars OOB as the PTSD transit. For now, Mars is square to Uranus in Taurus, however, as an "out of sign" square, the intensity is weakened, at least until Mars moves back into Aquarius. Jupiter in Scorpio's trine to Neptune retrograde in Pisces may mess with our natural talents. That is the irony with this aspect. We may feel as though we are doing great, but we may actually be perceived as "phoning it in." We may experience a disruption for a few days relative to skills we thought we had honed. We may need to pay close attention to our abilities and how others are perceiving those abilities. Jupiter's sextile to Pluto retrograde in Capricorn won't mess with us, as much. This one helps us to adapt to changes and transitions that we are experiencing. 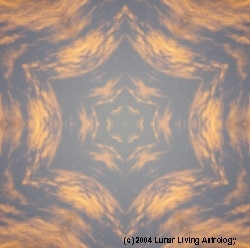 This full moon may feel disorienting, even with the grand-trine/kite pattern. With the very low number of masculine placements, one in fire and one in air, we may stuck in low gear while everything around seems to be zipping past us. We are in slow gear for a reason. There is safety in the methods requiring us to move with caution. We'll be back on track in no-time and then we will have a better understanding of why it was important to plod along during the full moon. In the meantime, dust off the old processes and explore why some things from the past are still useful. Two shapes in a painting, happening in the same space, create a time between them -- kind of a rhythmical occurrence.